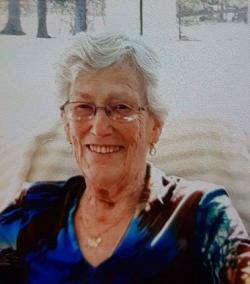 Katherine Ruth Boyer of Perth-Andover, NB, passed away peacefully at Hotel Dieu St. Joseph Hospital on March 25, 2019. Ruth was born in Moncton, NB, on July 10, 1932. She was the daughter of the late Walter and Alvaretta (Bleakney) Burdon. Ruth leaves behind her daughter, Sharon Geldart (Howard) of Arthurette, NB; her sons, Brian Boyer (Dawn) of Port Hope, ON, Andrew Boyer (Nancy) of Moncton, NB; her grandchildren, Dallas Boyer, Breanne Gibbens, Jamie Geldart, Kris Geldart, and Adam Geldart; great grandchildren, Ava Geldart, Kamden Geldart, Jaxen Geldart, Emma Boyer, Colin Boyer, Jaxson Gibbens, and Jacob Gibbens. Ruth was predeceased by her parents; her husband, Frank Boyer; her sister, Melda MacLean; her brother, Eric Burdon; her sister-in-law, Mildred Burdon; and her brother-in-law, Gordon MacLean. Ruth was a member of St. James United Church of Canada for over 60 years where she was the organist and choir director. She was also a member of the UCW, the Order of the Eastern Star, Electra Chapter #9, the Perth-Andover Community Choir, and the Caribou Choral Society. Funeral service was held on Monday, April 1, 2019 at 2 pm from St. James United Church in Perth-Andover, NB. Rev. Steve Longmoore officiated. Interment will be in Larlee Creek Cemetery at a later date. Music for the service was by the Perth-Andover Community Choir. Remembrances were shared by Garth Dingee and Sharon Geldart. Pallbearers were Jamie Geldart, Adam Geldart, Kris Geldart, Dallas Boyer, Breanne Gibbens, and Tommy Argue.